tradition – Random. Structured. Haphazard. All Me. This post isn’t advocating that you go and see the movie if you’d much rather not. However, it does stress on the aspect of enjoyment you’d get and the surprise you may feel if you did. Set in the backdrop of the catastrophic floods that ravaged parts of Uttarakhand back in 2013, this movie has people, communal tensions and the fury of nature playing critical roles without anyone giving an inch to the other. If you have star crossed lovers on one side, you have bigotry on the other and everything getting submerged (excuse the pun) under the torrential flows of water. Sara Ali Khan- is a surprise. Mainly because so many other young debutantes, barring Alia Bhatt and Anushka Sharma, have failed at being convincing or even realistic. She doesn’t sound like an NRI who just got off the plane and neither does she seem uncomfortable in her own skin. Her body language is spot on when playing a devil may care young girl who flouts societal norms and her ‘in your face’ attitude seems to flow naturally. She could have gone with more modest attire when playing a girl who’s father is a staunch Hindu priest and one who lives in a town built around religion and myths. But if you have Abu Jani and Sandeep Khosla dressing you up for the movies, then the look of a small town girl is probably hard to pull off. She could take a leaf out of Anushka’s book ala Sui Dhaga. Sushant Singh Rajput as Mansoor is believable as a (pitthoo) guide who lugs the pilgrims up and down the mountains. A lot of Bollywood actors get so used to the urbane, yuppie roles they play that even when they have to go deglam, they can’t get into the skin of the character. Mansoor doesn’t appeal unworldly, far from it, but he does appear to be straight talking and knows who he is. SSR could have avoided the SRK-like posturing towards the fag end of the movie but the scene called for drama and SRK does drama; cliched as it were. 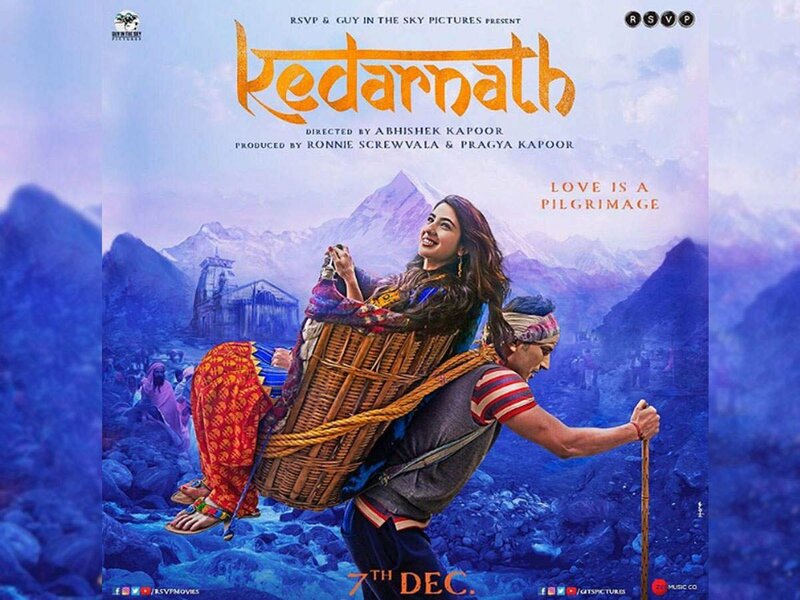 Pooja Gor, Nitish Bharadwaj, Nishant Dahiya, Alka Amin and others round up the cast and bring to life the stronghold that religion has not only on the lives of the people in Kedarnath, but their actions, their thought processes and ultimately what they deem is right or wrong. All these actors with their strong backgrounds in television bring in a whiff of freshness amongst the acting talent that’s been around in Bollywood for a while. Amit Trivedi’s score for the movie isn’t fantastic but the song Namo Namo certainly is. The visuals are quite breathtaking and made me want to visit the place. Any movie that evokes that kind of a feeling in a viewer must be doing something right. The images of the lake overflowing, the cloudburst don’t look realistic at all. Even back in the day movies like The Day After Tomorrow was able to make tsunamis and rampant destruction look believable. But special effects only add to the mix in a movie like this. At the end of the day you still feel bad when the boy and girl fall prey to nature, stigma and society. What remains is a good time that was had, hummable music and lovely visuals!